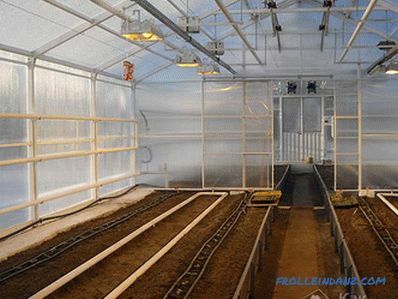 To get a high yield and protect your vegetables from the negative effects of fog and high humidity, you need to take care of the installation of the greenhouse. 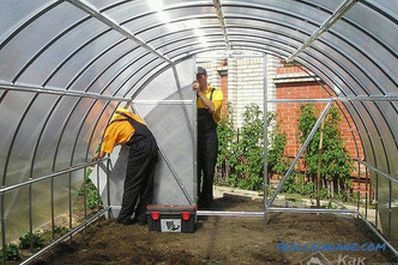 Often in the manufacture of greenhouses, gardeners use plastic wrap, but it needs annual replacement, which entails financial costs. 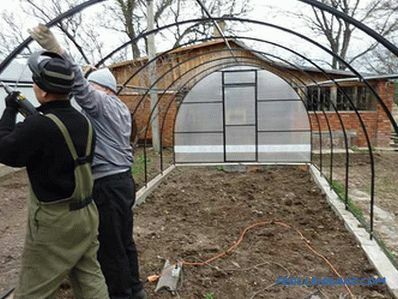 We will tell how to make a greenhouse from polycarbonate, demonstrate all the pros and cons of this material. This material is made in as two-layer sheets of plastic with different thicknesses. As a rule, sheets with a size of 6 * 2.1 m and a thickness of 4.5 mm are used. It is highly durable and remains intact with minor impacts (its strength is about 200 times higher than normal glass). 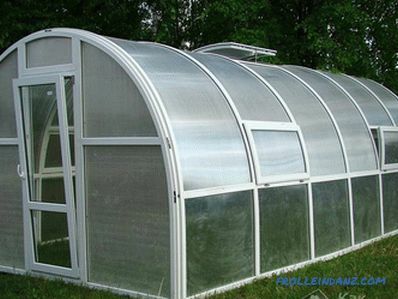 It fully protects the plant in the greenhouse from the adverse effects of ultraviolet rays. Resistant to temperature drops from -40 to + 60̊С. The material is able to disperse the incoming sunlight, and, accordingly, the combustion of plants is excluded. Double-layer plastic has high thermal insulation properties. 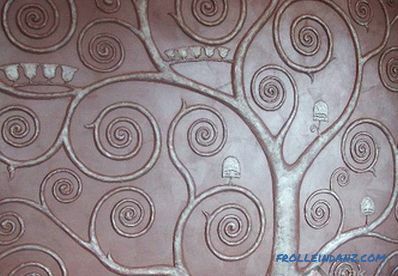 The material is easy to machine and easy to cut and drill. As fasteners for the design can be used as screws, and an electric screwdriver. 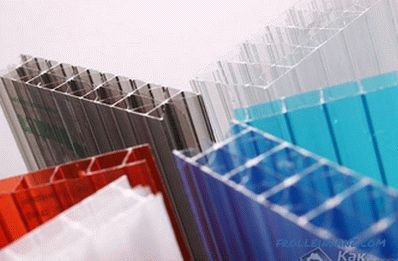 The mass of polycarbonate is less glass, which greatly facilitates its installation and transportation. The surface of the material has a dust-repellent quality, and the impurities that appear are removed with ordinary water. Polycarbonate is not flammable, but when interacting with fire, it begins to melt. Its cost is similar to the cost of ordinary glass. in winter time to no ice was formed on the surface of the greenhouse, which may further lead to def Formation and even destruction of the structure. 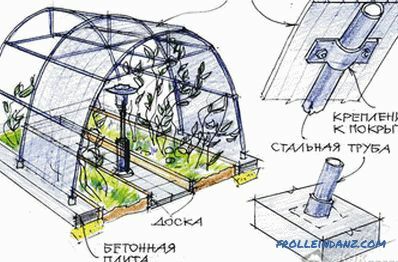 It is best to carry out the drawing of the greenhouse, as well as mark the place where it will be installed in the garden plot. Under the greenhouse you need a lot of free space away from trees and structures to provide good ventilation and plenty of light and heat. 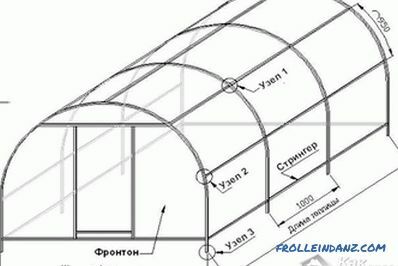 the most common is an arched roof, especially if it is polycarbonate, but there are also difficulties in making an arched roof. The arch is made of metal corners and pipes, and for this you will need a special pipe bender or you will have to purchase ready-made arched structures. 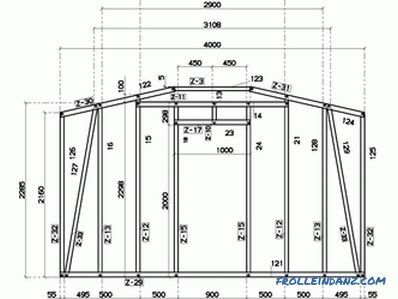 If you chose a place, dimensions, shape, and there are necessary drawings, you can begin the arrangement of the foundation. 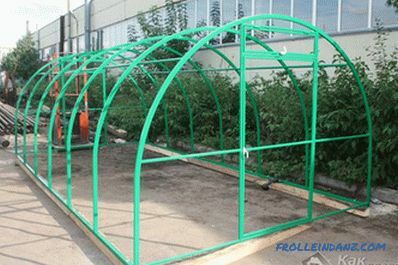 For the greenhouse, the foundation is very important, and the strength of the structure depends on what quality it will be. There must be holes for ventilation in the form of window and door openings. The roof should be made in the form of an arch, thereby increasing the volume of air in the structure. The built-in leverage system will allow you to open vents embedded in such a roof. The pane size must be at least 1/4 of the entire roof surface. Additional air circulation will be provided by doors located in the end or side walls of the structure. For paving, select paving slabs, and ridges enclose high curbs that will greatly facilitate the process of caring for plantings. Secure the rods under the ceiling space, which will be needed to secure some plants. 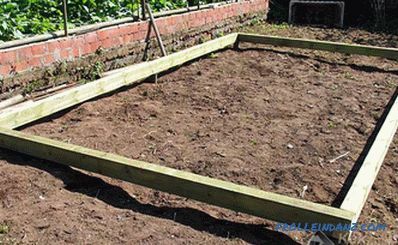 The first step is to lay the foundation in parallel with which fences for ridges are poured. 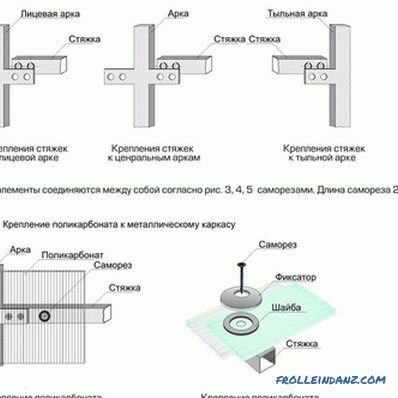 For the frame, it is better to use square pipes or metal corners. At first make a binding, and then fix it on the base. The metal structure must be carefully painted before installation, otherwise it will succumb to corrosion. The strapping is fixed on the foundation with anchor bolts. wooden supports are attached to the corners and driven into the ground; 10 to 10 cm stacked around the perimeter of the base of the greenhouse. The brick foundation is distinguished by its quality and service life. 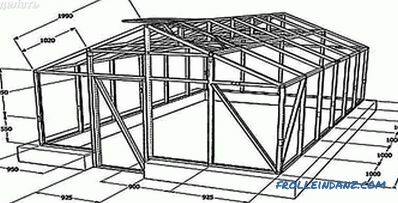 If it is right to build such a foundation, then it can serve for a long time, but it will take a lot of brick to make it to support the weight of the greenhouse. First, a cushion is made with waterproofing to protect against the destructive action of moisture from the soil. 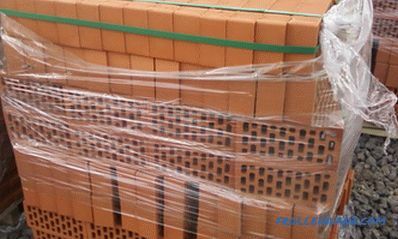 In the construction of the brick foundation used conventional cement-sand mortar. In order to make the foundation of a brick more sustainable, it must be plastered. 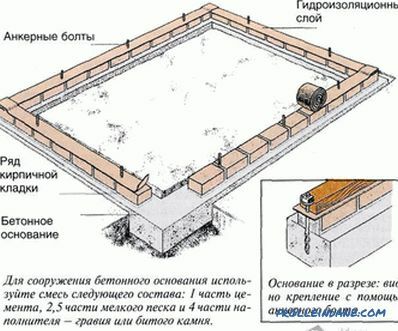 A stone foundation is also suitable, since such a foundation is durable and designed for any loads. It should be borne in mind that laying a natural stone of unequal shape requires certain skills, and independently making a stone foundation is not an easy task. It is best for the solution to use clay mixture in a ratio of 1 * 1. Such a solution will contribute to heat saving. So that the clay is not washed out with water, the foundation should be plastered, and if it turned out too uneven, then put the formwork and pour concrete on the edges. padding that protects the foundation from sinking. The cushion is made of gravel or sand. Then the formwork is laid according to the shape of the greenhouse. The solution is poured to a width of 30-40 cm, depth - approximately 0.5 m.
This technology will ensure the high strength of this foundation. Any of these bases should be set up at a distance of 25-30 cm from the ground level. This will protect the foundation from destruction, and the construction will last a long time. First of all, you need to build a frame. Plastic, aluminum and galvanized profiles are used for the frame. 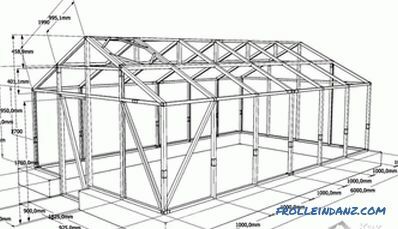 But given the seasonal load, for example, the heaviness of a large amount of snow on the roof of the greenhouse, it is better to use wooden blocks for the framework, since by its properties the tree is able to withstand heavy loads. After the frame is ready, the arched elements are fastened together. Then the frontal parts of the greenhouse are mounted - a door and a vent without fail, so that the room is well ventilated. At the end of the work, the frame is covered with polycarbonate sheets. They are stacked end to end and are connected using a connecting profile using rubberized thermo washers to protect fasteners from dirt and moisture. An important role is played by a correctly assembled frame made of reliable materials, one of which is a profile. We will not elaborate on the factory constructions from the profile, as in the purchased kit you will find detailed assembly instructions. 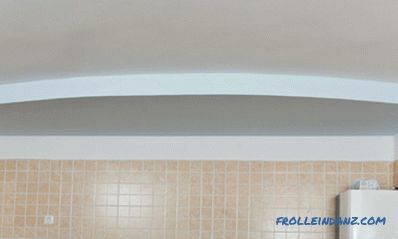 Let us dwell on a more economical option - the frame of the profile for drywall. The design with rounded shapes will not work, but the frame will be strong enough to withstand snow and wind loads. The profile is galvanized, so it is not afraid of moisture. Ability to assemble the frame without attracting assistants. The design is quite light. 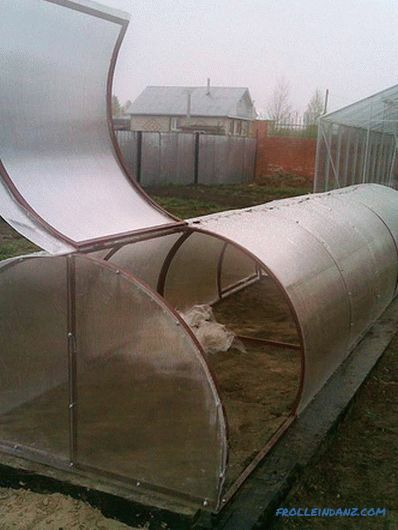 It is convenient to fasten polycarbonate sheets. 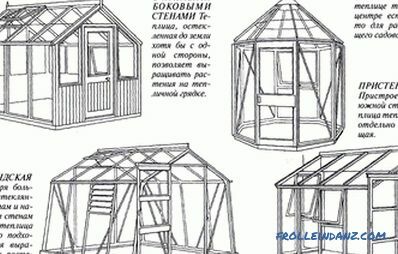 First you need to make a drawing or at least draw a future sketch greenhouses with dimensions. After that, using the resulting data, cut the workpiece. Now to the foundation with anchors you need to fix the profile, which will serve as the basis of the whole structure. After that, you can proceed to the installation of the frame. As for the assembly of the frame, everyone decides to do so he is comfortable. We recommend that you assemble the arches on a horizontal flat surface, and then mount and trim. How to fix the sheets already written in the article. 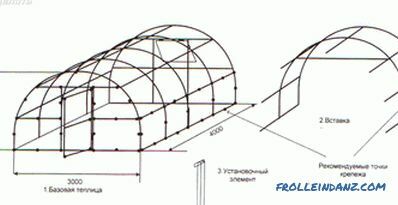 Framework for the greenhouse can be make of several types of pipes. If the frame is metal, it is better to use shaped pipes, welding them with electric welding. The arched structure suffers less snow loads, but in order to give the pipe a shape, you need to use a pipe bender. 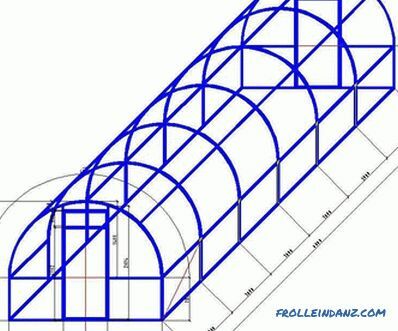 If there is no desire to bend pipes or buy ready-made arches, then you can make the shape of the greenhouse the same as that of a metal profile - with a sloping roof. Racks are attached to corners and walls of the trim by welding. At the same time, mounted doorways. On top of the pillars and door construction is made upper trim, which are attached to the arch. After that, proceed to the installation of arched window vents on the roof and fixing the hinges to the ridge. Build a lever system for lifting window vents, then proceed to paint the frame. 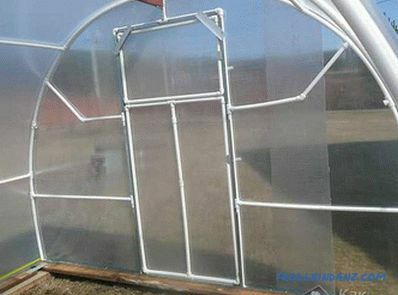 It is undesirable to make the frame of the greenhouse from round pipes, because screwing the polycarbonate, the screw may slip to the side and damage the sheet. 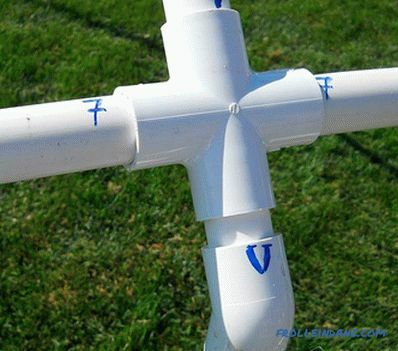 You can quickly assemble a simple frame from polypropylene pipes. 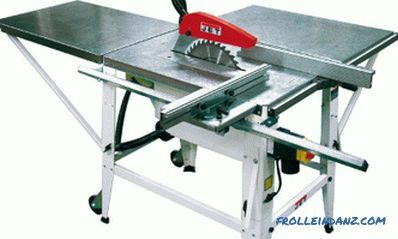 Again, you need to make a drawing and cut the workpiece. 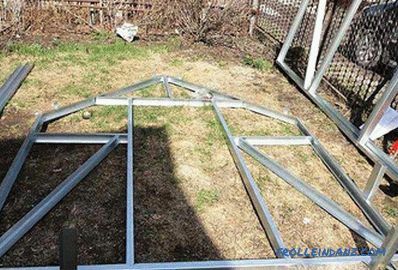 To assemble the frame, you will need a soldering iron, and a certain number of pipes and fittings will need to be purchased in accordance with the chosen shape of the greenhouse. One of the advantages of a polypropylene tube frame is the perfect combination of strength and flexibility of this material. 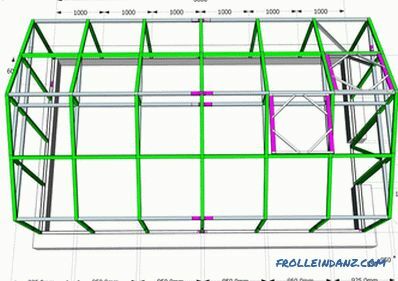 Flexibility allows you to give the frame the desired shape, and, strength allows you to withstand considerable loads. For convenience, you can make a ventilation window in the door. Once the frame is assembled and fixed, it can be sheathed with polycarbonate. Now it is important to take care of the insulation and the greenhouse heating system. 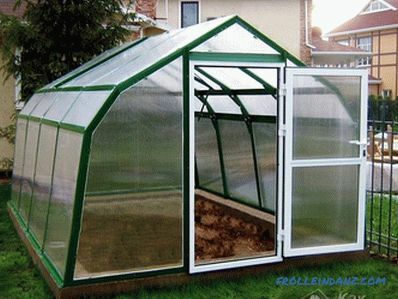 Modern technologies involve the use of transparent or bubble plastic for warming the greenhouse inside and out. The advantage of this solution is that this material does not absorb sunlight and looks decent. Oven heating - for this, a stove or a brazier is built, and ventilation is installed to ventilate the room. 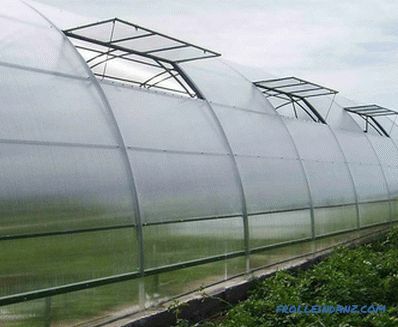 The disadvantage of this method is that heat is distributed unevenly over the area of ​​the greenhouse. Electric heating is carried out with the help of a convector and heating elements. In this case, ventilation is not needed. Water heating is performed by installing pipes to which hot water is pumped from a boiler using a pump, which is heated by electricity, gas or coal. When using gas and solid fuel, ventilation is necessary. Also, this method is time consuming and costly. Gas heating is carried out using catalytic burners. This requires constant ventilation and ventilation throughout the greenhouse. Heating in the greenhouse may not be entirely cost-effective, but, as the saying goes, the goal, and in our case to collect a rich harvest, justifies the means. Sheets of material are laid strictly according to length, fix them with screws, or special shims. They securely fasten the polycarbonate to the arch of the frame and save it from deformation during expansion in the winter. The role of the pressure plate will play corners for plastic arch, which you can buy in the store building materials. 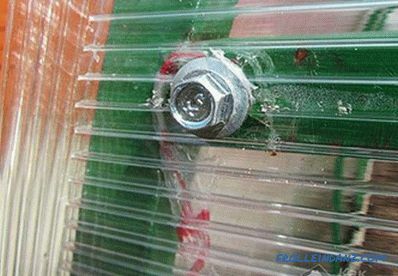 Before starting the installation, it is necessary to rid the polycarbonate of the packaging film, smear the edges with glue and fix the plastic corner. Open edges of the material are treated with scotch tape or sealed tape, and the bottom edge with perforation will provide the desired drainage effect. To connect two sheets of polycarbonate with each other use the intended connecting bar. 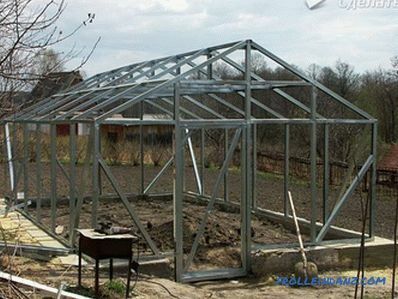 Then you can proceed to the mounting of polycarbonate sheets on the frame of the greenhouse. 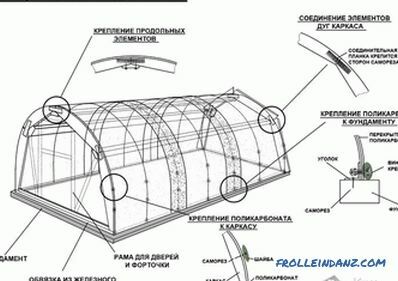 Initially, the roof is sheathed with polycarbonate sheets, and only then the remaining part of the arch from the ends. Further, the walls and doors of the structure are finished with the material. Connections at the corners are closed with metal or plastic corners. After that, remove the remains of the protective film. The finishing touches can be considered the installation of fittings, handles, gate valves and fixing hooks on the door, as well as a rubber seal on the air vents for complete sealing. Even if you, having no experience, you will be forced to entrust some of the work to professionals, more volume will fall on your shoulders. Therefore, try to approach the process with full responsibility to continue to enjoy natural products grown in the greenhouse.